The Orthodox Church in America’s Department of Youth, Young Adult, and Campus Ministry will host a youth/young adult service pilgrimage to Alaska from June 23 through July 2, 2014. The unique cemetery at Eklutna’s St. Nicholas Church. The trip is open to those ages 18-30. 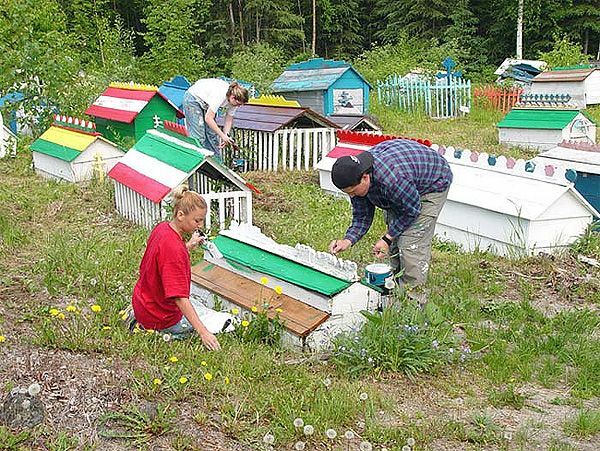 Participants will arrive in Anchorage and travel to Eklutna to help renovate the village’s historic cemetery and church under the guidance of Priest Mikel Bock. They also will engage in native culture, history, and the cycle of parish life at Saint Nicholas Church. Accompanying the participants will be a priest from the “lower-48” who will join Father Mikel in providing theological reflection and spiritual guidance. For details on costs, a comprehensive schedule, and registration info, please send an e-mail to Andrew at aboyd@oca.org.